The Muslim Council of Britain and the Church of England have condemned a spike in hate crimes recorded by police forces across England and Wales since 2012. The targets of hate crimes are predominantly Muslims according to activists. Racially or religiously aggravated harassment crimes – such as verbal or written racist abuse – increased from a total of 15,249 to 17,605 between 2012 and 2014. The figures, obtained from 41 of 43 police forces approached through Freedom of Information (FoI) requests, show more than 47,000 hate crimes recorded over the past three years. In August 2014, Martin Sallis, 42, from Chester, hung bunting covered in swastikas and Ku Klux Klan symbols on the site of a planned mosque. On the bunting, Sellis wrote: “Burn in hell.” He later pleaded guilty to causing racially or religiously aggravated public fear, alarm or disorder. In December 2013, Jude Phillips, 50, and Gemma Parkin, 18, tore pages from the Koran at a Middlesbrough FC home game to make confetti. Despite denying the charges, they were both found guilty of the offence and were fined £250 each. 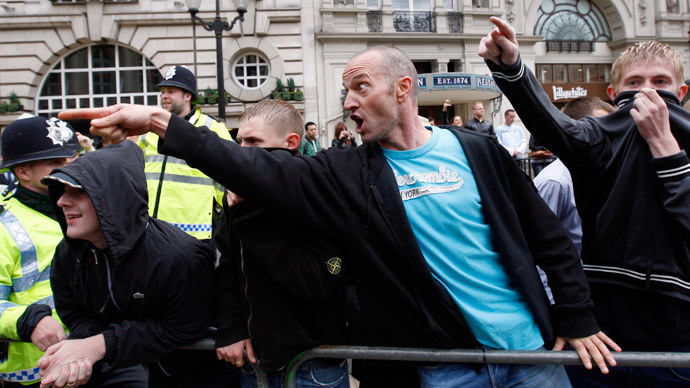 Muslims have been the main victims say anti-racism campaigners, partly due to the rise of the Islamic State (IS, formerly ISIS/ISIL), the murder of Lee Rigby by Islamic extremists in 2013 and right-wing political parties’ anti-immigration rhetoric. “With racist bullying in schools attributed to Islamophobia on the rise according to ChildLine, job discrimination against Muslims commonplace and regular attacks against Muslims ... there is a serious concern that needs to be both acknowledged and tackled,” said Shafi. Some 29 forces recorded a rise in racially and religiously aggravated harassment crimes, with an average increase of 13 percent across the 40 forces that provided year-by-year figures. City of London Police only provided an overall total (113) and not a year-by-year breakdown. The forces with the biggest increases between 2012 and 2014 were Lincolnshire (67 percent), the Metropolitan Police (60 percent), Cleveland (45 percent), Merseyside (42 percent) and Northumbria (40 percent). The biggest falls recorded across England and Wales were in Warwickshire (-33 percent), Wiltshire (-21 percent), Devon & Cornwall (-20 percent), Lancashire (-17 percent) and Dyfed-Powys Police (-15 percent). Greater Manchester (5,883), West Midlands (4,792) and the Metropolitan Police (4,491) reported the highest total of recorded crimes - 1,500 more than any other force. Police forces attributed the recent rise in figures to improved reporting of harassment crimes, but anti-racism organizations were quick to stress an actual increase in incidents. Suresh Grover, director of the Monitoring Group, a UK civil-rights charity, suggested the rise of the Islamic State, the murder of Lee Rigby and the growing popularity of UKIP have all fostered an environment of “respectable racism” across England and Wales. “All hate crimes should be prioritized, but the police have de-prioritized racial crimes, and that’s a scandal after the [racially motivated] murder of Stephen Lawrence in 1993,” he said. “In the UK, racism is sometimes seen as something that’s been done and dealt with, but these figures show how that’s far from the case in reality,” said Burnett. Jamaican-born Irvin Campbell, 57, who arrived in the UK aged seven, became the victim of a racially aggravated harassment incident last year as he drove through his Bristol neighborhood. A car filled with white men – all in their 20s – blocked Campbell’s way, prompting him to get out of his vehicle. “They were hurling all sorts of racist abuse at me, calling me every c-word under the sun,” Campbell recalled. “Then they told me to f*** off back to Somalia. Chief Inspector Paul Timmins from Lincolnshire Police, the force with the largest rise in the harassment crimes, welcomed the constabulary’s increase in reporting figures. A spokesman for Warwickshire Police, the force with the largest fall in harassment crimes, meanwhile described hate crimes as “underreported” across the country. “There’s still a lot of work to be done and we will be launching a major new campaign in the next few months aimed at further increasing reporting of hate crime,” the spokesman said. The National Police Chief’s Council (NPCC) lead for hate crime, Assistant Chief Constable Mark Hamilton, commented on the spike in figures by describing all forms of hate crime as “unacceptable” and encouraged any victims to come forward and report incidents. “Over the years we have noted that hate crime tends to increase following critical incidents in the UK or during global conflicts. Responding to claims that the party had contributed to the rise in the harassment crimes, a UKIP spokesman said: “In surveys all ethnic and religious groups think that there should be greater control over immigration, a policy that UKIP endorses.